Hydroponic growing, or growing plants without soil, is a well-known method of raising plants like tomatoes and orchids. Less well-known is a similar system, called aquaponics, that integrates the raising of fish for food into the hydroponic system. Most people have heard of hydroponics, even if they don't know exactly what it is. In short, hydroponic agriculture is a way to grow plants without planting them in traditional soil-based configurations. Hydroponic systems are often used indoors to grow tomatoes, orchids, marijuana, and other sensitive plants. Other plants, including vegetables and herbs, can be grown hydroponically, though it's less common. Basically, hydroponic agriculture involves the setup of an indoor system, which can range from very simple to very complex. At its most uncomplicated, a hydroponic system consists of a fluorescent light designed to help plants grow, and a water system that circulates through the plant roots. More complicated systems include methods of aerating roots, suspending plants, distributing nutrients, and so on. Now, with that basic knowledge about hydroponics, you're ready to learn a little about a new, relatively little-known type of agriculture known as aquaponics. As the name suggests, aquaponics bears certain important similarities to hydroponics. The roots "aqua" and "hydro" both refer to water, indicating how crucial water is to both systems. The difference is this: while hydroponic systems focus on plants and how best to grow them indoors, aquaponic systems incorporate not only growing indoors but also raising fish indoors. Here is how to build aquaponics at home. 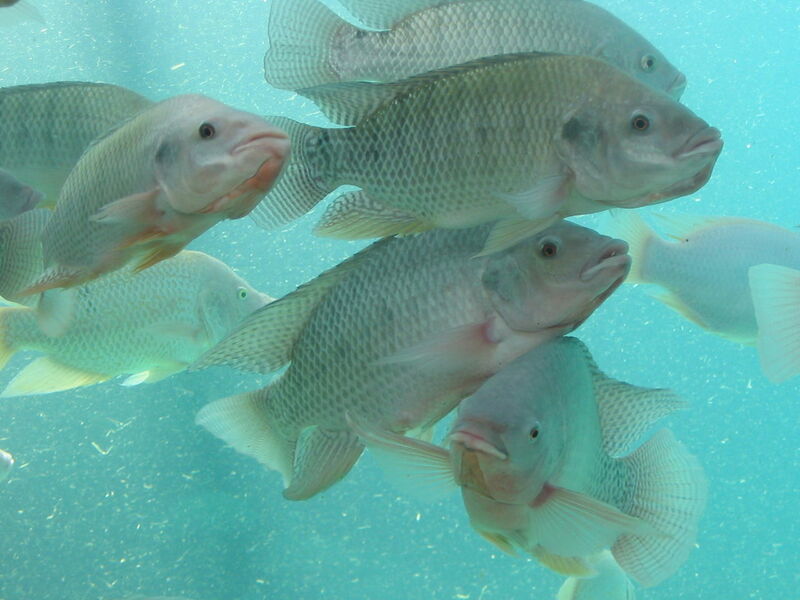 The essential idea behind aquaponics is that freshwater fish like tilapia, in addition to being used for food, can be integrated into a mini-ecosystem with hydroponically grown plants. In their natural habitats, plants interact with all other organisms and elements in their ecosystems, forming a sort of "circle of life". For example, tomato plants grown outdoors interact with other plants in the area, various types of bugs, larger animals (who might eat the fruit), and microorganisms that help or hinder their growing. But, this is just the beginning. The plants need nutrients, which they get from the soil. The soil, in turn, can get nutrients from dead plants, animal waste, or any number of other sources. Moving part of this system indoors in the goal of hydroponics, and aquaponics expands on that idea. In a typical hydroponic system, growers add nutrients to the water, to soil, or to another growing medium to help the plants grow to their fullest potential. These nutrients can come from a wide range of sources, but man-made nutrient solutions that come in bottles are very common. The ingredients of these nutrient solutions vary widely, from organic plant material to animal based concoctions, chemicals, and everything in between. Aquaponic growers try not to use these man-made solutions, preferring to create a holistic system where fish provide the nutrients for the plants in the system. Fish are a good source of plant nutrition for a number of reasons. Animal waste can be high in chemicals that plants need, such as nitrogen and potassium. Bacteria can break down nutrients in the water, making them usable for plants. As fish inhabit freshwater tanks, the nutrition content of the water in the tanks changes, becoming less sterile and more beneficial to plants. (This, it goes without saying, is why plants grow so well in fresh, unpolluted water in their natural environment.) The water from the fish tanks can be cycled to water plants. Plants, in turn, have their own effect on the quality of the water, acting as a natural water filtering system, along with the growing medium and the bacteria. The water, newly cleaned by thirsty plants, can be added back to the fish tanks, promoting the health of the fish. Of course, aquaponic systems aren't perfect: the fish still need to be fed, and the fish food typically must come from an outside source. Because aquaponics is such a new science, there is little agreement about what, exactly, is the best way to feed the fish in the system. What is clear, though, is that this type of indoor agriculture has great potential. Natural principles are being used to raise fish and grow healthy food crops, and indoor growing technology allows aquaponics to work in densely populated urban areas or harsh landscapes where raising edible fish and growing vegetables would otherwise be impossible. As a method of creating local, sustainable, organic, and healthy food that doesn't have to be transported long distances and doesn't require harsh industrial chemicals or processes, aquaponics has great potential.